Snooper 4ZERO Elite speed camera detector provides GPS, radar and laser detection and includes FREE subscription for the lifetime of the product. It is also the only speed camera detector that is both Windows PC and Apple Mac compatible. Buy accessories for the 4Zero Elite here. Snooper 4ZERO Elite has been DISCONTINUED. The replacement model is the Snooper 4ZERO Elite BT. 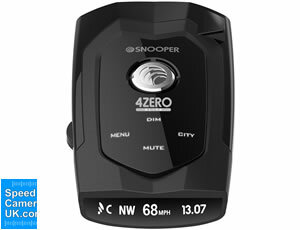 The Snooper 4ZERO Elite is a speed camera detector featuring GPS, radar and laser technology. Plus the added benefit of this Snooper speed camera detector is that the subscription is FREE for the lifetime of the product. The Snooper 4ZERO Elite also features directionality so you will know whether the speed cameras are enforcing your side of the road using the directional alerts. Plus the 4ZERO Elite is Mac compatible as well as Windows compatible. Voice and beep alerts warn you to each speed camera location across the world. 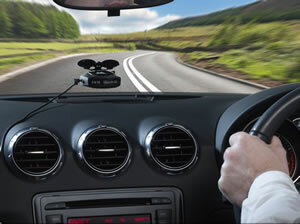 A voice alert will tell you the type of camera you are approaching and the speed limit will display on screen meaning you do not need to take your eyes off the road to know there is a speed camera in the road ahead. The OLED screen displays GPS signal strength, City Mode status, Electronic Compass, your vehicles speed and the current time. Set up is simply 'plug and play.' Included in the box is a cigarette lighter adapter, dashboard mount and windscreen mount giving you 2 options to mount the Elite in your vehicle. A worldwide speed camera database is included with the Snooper 4ZERO Elite. Access to this worldwide database is free to download from for the lifetime of the product. 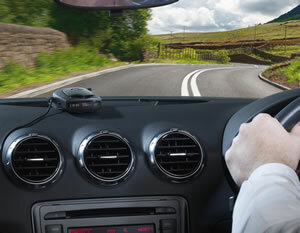 GPS alerts will alert you to all speed cameras within Snooper's AURA database. You will also know which Gatso speed cameras are live, working and active using the built-in radar detection. 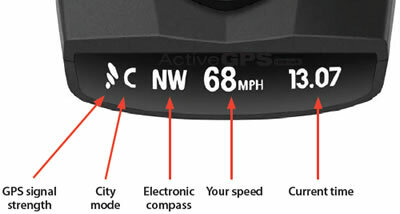 This enables you to know which Gatso radar based speed cameras are indeed working or are turned off and inactive. Control the volume of the Snooper 4ZERO Elite with the volume dial. Plus there is a mute button to receive no sound warnings. There is a City Mode which can be switched on the reduce the number of false alerts from shop doorway sensors, shop and house burglar alarms and such like when using the radar and laser detectors. There is also a Motorway mode whereby alert volumes for detection can be predetermined. Not only will the Snooper 4ZERO Elite warn you of laser speed cameras targeted from in front of your vehicle it will also alert to laser guns targeted from behind your vehicle. Like all Snooper speed camera detectors and sat navs, the Snooper 4ZERO Elite gets its speed camera locations via the Snooper AURA speed camera database. Updated daily, the AURA database can be downloaded to the device via a PC connected to the Internet with USB connection. It's important you regularly update, as the 4ZERO Elite GPS database is only as good as the last download. Snooper 4Zero Elite can be used as a standalone Laser/Radar detector in countries not mentioned above. Please check local laws on speed camera detection before purchasing. AURA database is available via FREE subscription from the manufacturer and there are no additional charges to pay once you have bought the Snooper 4ZERO Elite speed camera detection device. Learn even more about the Snooper 4ZERO Elite by reading the manual. Please click the PDF logo below. The manual opens in PDF format. The Snooper 4Zero Elite will only operate on Windows computers. Specifically, you must be using Windows XP, Windows Vista, Windows 7, Windows 8 / 8.1, Windows 10. Additionally the software will only work with Internet Explorer 8 or Firefox 10 or above. The Snooper 4ZERO Elite will also work with the Apple Macintosh operating systems. The Snooper 4Zero Elite will NOT operate when using Windows 95, 98, 98SE, Windows 2000 or Millennium. Subscription is FREE for the lifetime of the Snooper 4ZERO Elite. Updates via Windows based PC or Apple Mac computer. Snooper 4ZERO Elite - What's in the box? If you require additional accessories for the Snooper 4ZERO Elite these can be purchased via the Snooper 4ZERO Elite accessory page. Pictured below - windscreen mounted and dash mounted Snooper 4ZERO Elite, both options are included in the box when you buy the 4ZERO Elite from SpeedCamerasUK.com. Question: I'm interested in the Snooper 4Zero, please advise if camera updates can be done via mobile phone hotspot internet? Answer: While the Snooper 4ZERO Elite’s internal GPS speed camera database can only be updated via a compatible Windows or Apple computer. The new Snooper 4ZERO Elite BT (Bluetooth) model (which replaces 4ZERO Elite) does have the ability to update via a data enabled mobile phone with Bluetooth. You can also update the 4ZERO Elite BT via a PC (Windows/MAC) as well. Question: I was thinking of purchasing the Snooper 4Zero Elite. Before I do could you tell me will its performance be affected by the use of a sat nav and a separate dash cam? Answer: The Snooper 4ZERO Elite uses GPS, radar detection and laser detection which is all built-in and completely passive. It will not interfere with any other electronic device you might be using within your vehicle. Question: Can the Snooper 4ZERO Elite be mounted out of sight in the car, or does it have to be on the dash? I have a redundant glove box that I might want to put it in. Also, for local journeys , can I “teach“ the unit as to where I see mobile cameras? Can I also teach it to ignore false signals on my most used routes and to ignore them? The 4ZERO Elite features a built in GPS antenna, to enable a successful satellite fix placing the unit on the windscreen or dashboard would help to achieve this. The 4ZERO Elite built in radar and laser detector needs to have a clear line of sight of the road ahead, again placing the unit on the windscreen or dashboard would help to achieve this. You cannot teach the Snooper 4ZERO Elite to ignore false signals or add your own personal locations. You can however change the alert settings in the 4ZERO Elite menu. Can I suggest you read the manual for the Snooper 4ZERO Elite for more information. Question: Considering buying the Snooper Elite which your website says comes with free updates for the life of the unit, but reading the manual on your website it suggests there is an annual charge. Answer: I can confirm 100% that when buying the Snooper 4ZERO Elite from SpeedCamerasUK.com it DOES come with free lifetime speed camera subscription.